Christina Jones is a Kindergarten teacher from Canada. She used Noah's 258. 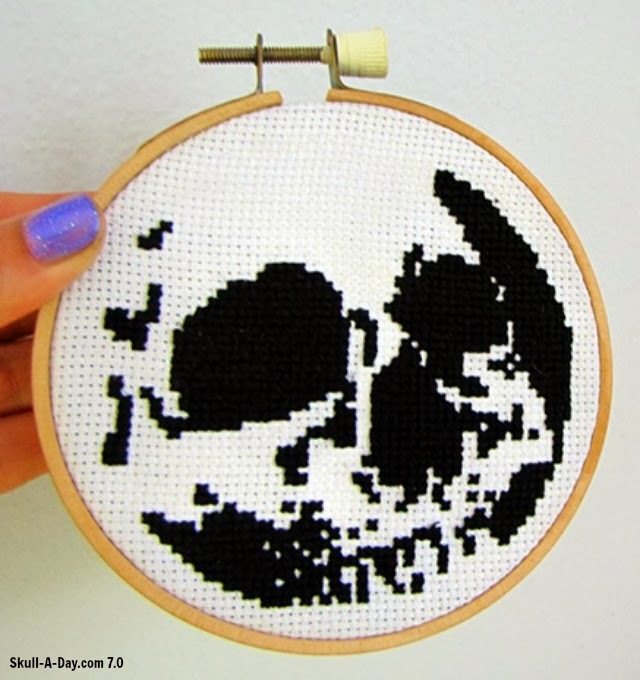 Cross-Stitch Skull pattern to create this skull. She keeps it in on a board in her craft room. 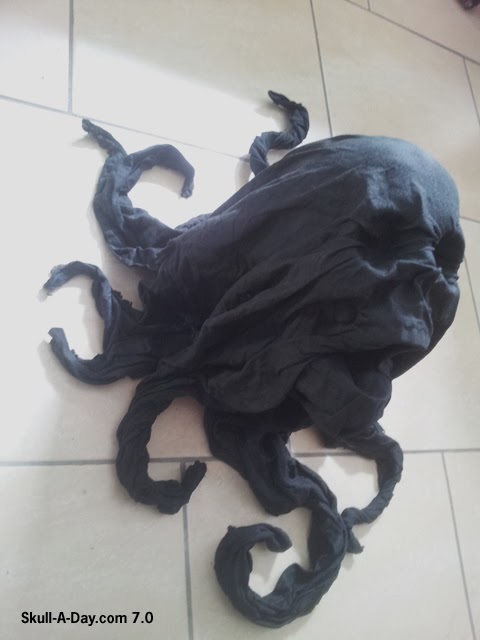 If you have create something using anything from our Free Stuff, please submit it to us! We'd love to share it! 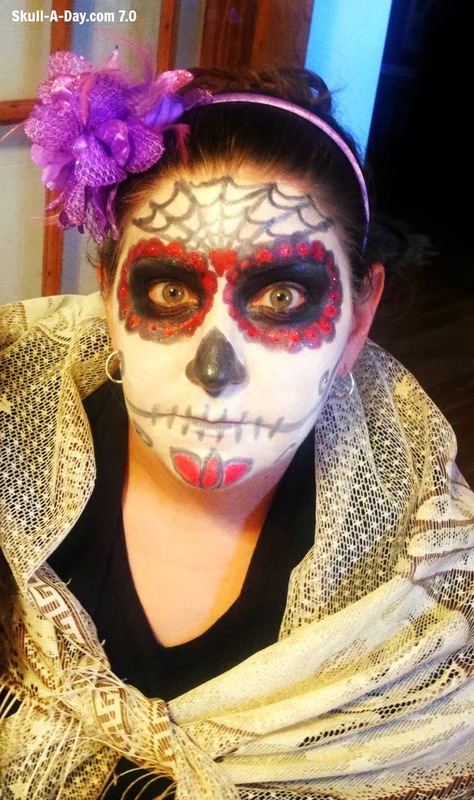 Alicia Troiani created this sugar skull makeup. 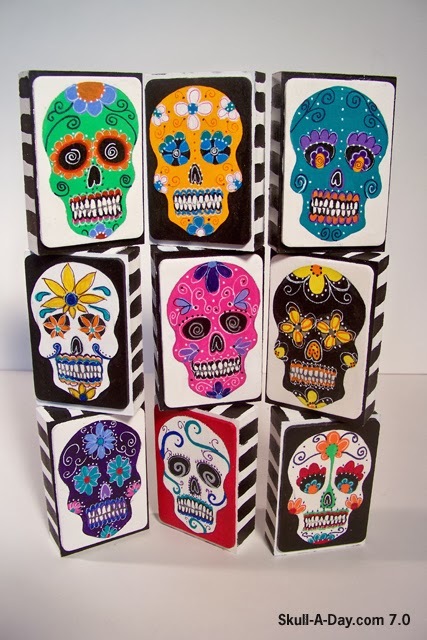 This is another great interpretation of the sugar skull motif in makeup form. 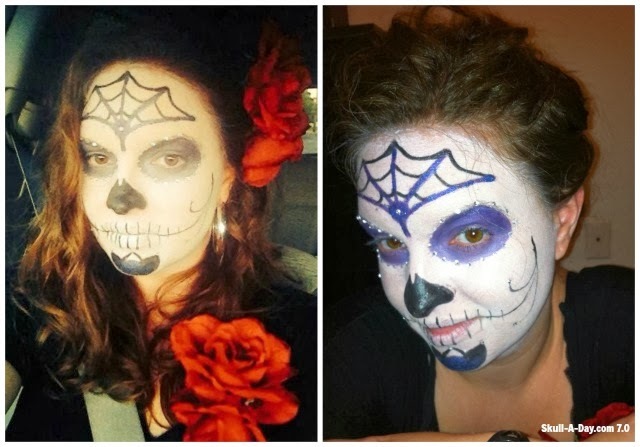 Painting a face as a sugar skull is commonly done during Dia de los Muertos and recently Halloween celebrations. I love that Alicia included a flower headband and shawl into her costume. That really helps bring together the costume of La Calavera Catrina. Milan, Italy is home to tattoo artist Raffaele Piacente, a.k.a.- Raffo Waffo who submits some skulls that literally stand out. These 3 dimensional pieces are created with fabric mixed with PVA and acrylic. The canvas truly takes on a life of it's own as it leaps off of the wall and right into your face. 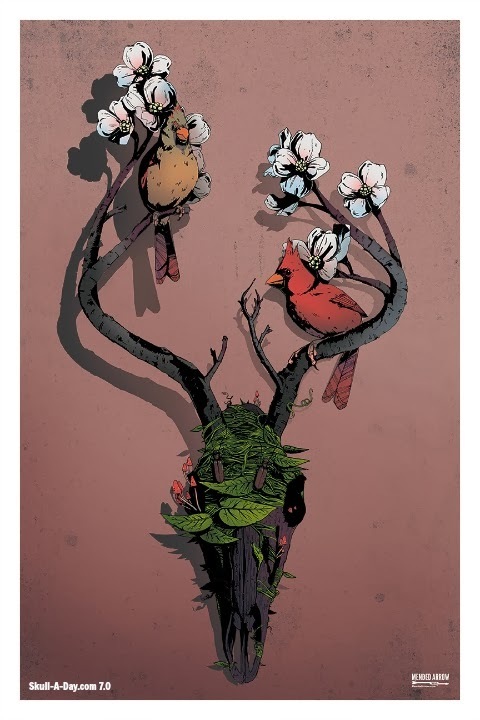 These are just 2 of the pieces he submitted so be sure to check out more of his killer work here. Thanks for sharing these with us, Raffo! All I can tell you about the origin of this hand crafted copper sheet with patina is that it is from The Bulldog in Ontario, Canada. Patina is what happens to copper when it is left exposed to the elements(example: The Statue Of Liberty is made of copper and has a patina on her). The Bulldog more than likely sped up the patina process with a chemical that makes it happen rapidly. I do like the blue and orange coloration together. It seems like a winning combination(you NFL fans might get my hint). Thanks for sharing your metal works with us, Bulldog! Miranda Ross an 8th grade Spanish teacher. When she's not teaching, she is crafting. She works with polymer clay and paints, creating original designs. 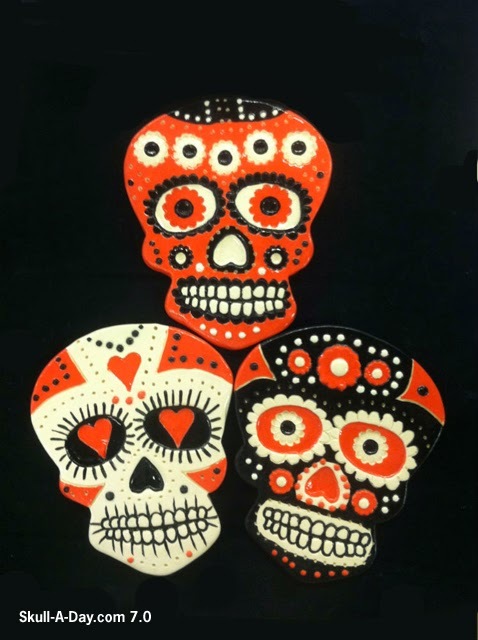 She loves making little skull earrings and upcycling any old piece of furniture she can find with the skull motif. 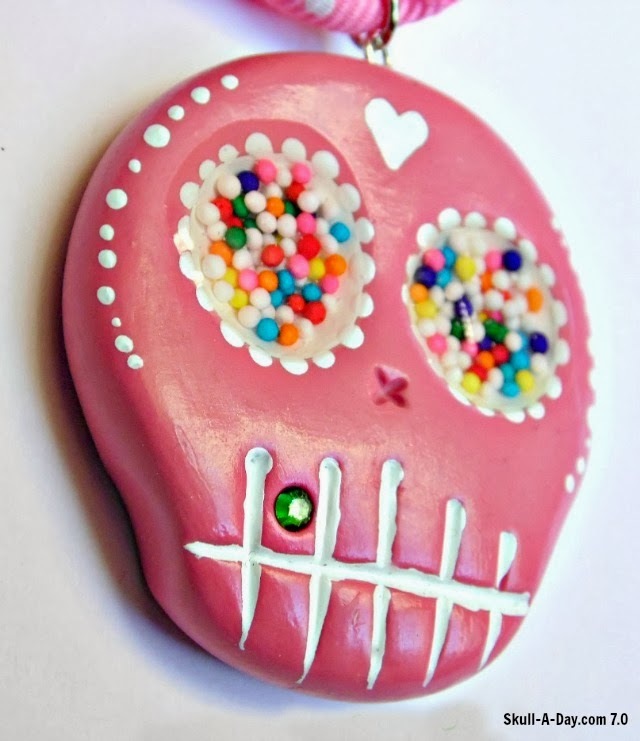 The photos she shared with us are of skulls with mustache earrings and a sugar skull necklace with real candy sprinkle eyes. 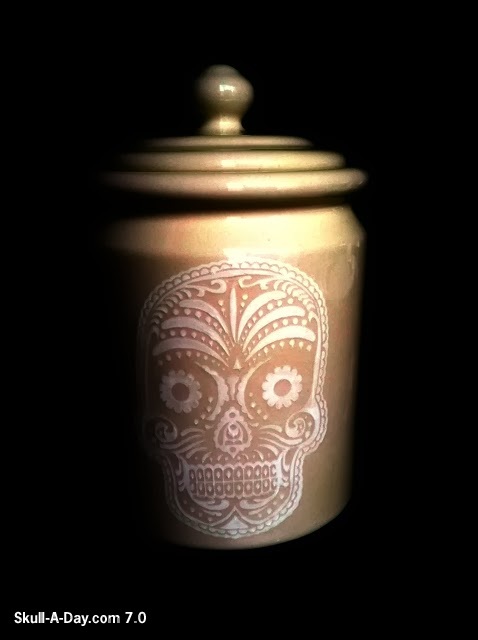 You can find more of Miranda's work on her website Sugar Skull Vintage, Facebook, and Instagram. Craig Jacobs found this skull on a wood floor. 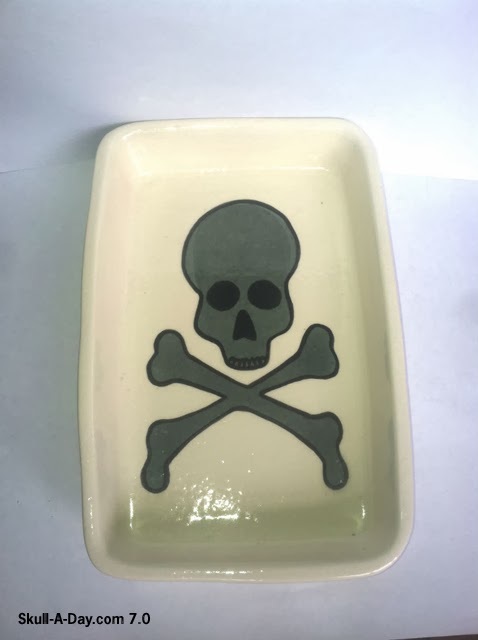 Holly Murphy of Zanesville, OH is rockin' tons of skulls in her ceramic and pottery works with lots of different designs and a diverse offering of items. This is just a sampling of what she's been up to(see more of her LotsaPotsa stuff here), but of course these skulls are our favorites. Holly's works are fun and functional, and we thank her for sharing them with us. Keep up the great work, Holly! Sarah Ménal of Nantes, France, drew this skeleton as part of a larger drawing in her "Terre de Sillons" series. I would have loved to see the larger drawing this segment is from, but I couldn't located it on her website. I do like that it's a little hidden gem among other whimsical designs. 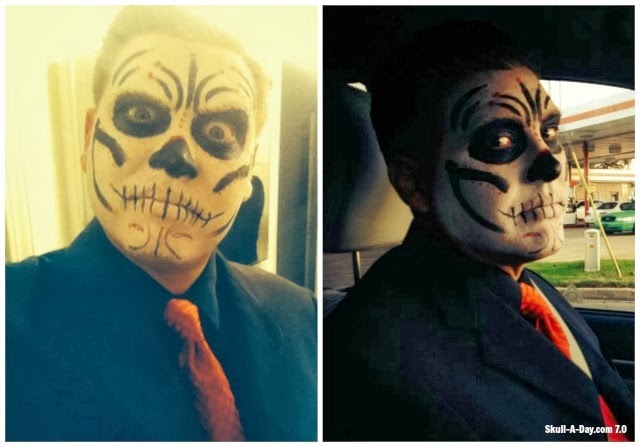 Will Rawlings and his wife Christie, from Bossier City, LA, were "skulled out for Halloween". Christie did the makeup. I love seeing skull loving couples. Especially in skull makeup. Thanks for submitting these! Ryan P. Kinney of Ashtabula, OH likes to play with dirt. Especially the clay kind. These three little guys(L to R- Jacque, Clay, & Graff) were made by Ryan from clay. Jacque and Graff are made from polymer clay and spray painted. Clay, my personal favorite, comes with a better story from Ryan, "Clay is made from natural earth clay from the first shovel of dirt in the groundbreaking when I built my barn. He was never baked or fired, but is still hard as a rock and has been solid for 4 years." Thanks for not being afraid of getting dirty, Ryan! No, I'm not talking about the kind of wallpaper for your desktop. Sorry. This elegant work of art comes from L.A.W. of Dundee, Scotland. You might remember her awesome entry into our last stencil contest(see here). This floral arrangement was done with pen on a wallpaper sample. Thus the cycle of life continues to move on from one form of matter to another. This sample piece was lucky enough to be transformed into something much more beautiful. Thanks again for sharing your great work, L.A.W.! 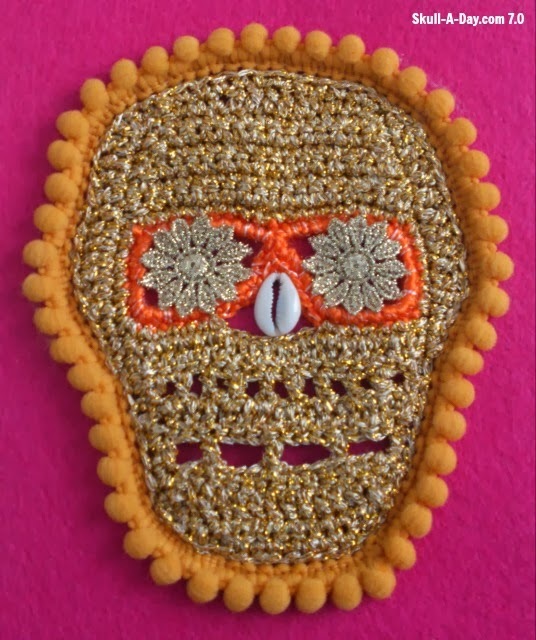 Espe Cialidades crocheted this baroque skull. If you are familiar with baroque artwork, it's commonly gilded, meaning covered with gold. This gold yarn is the perfect choice for this baroque inspired skull. 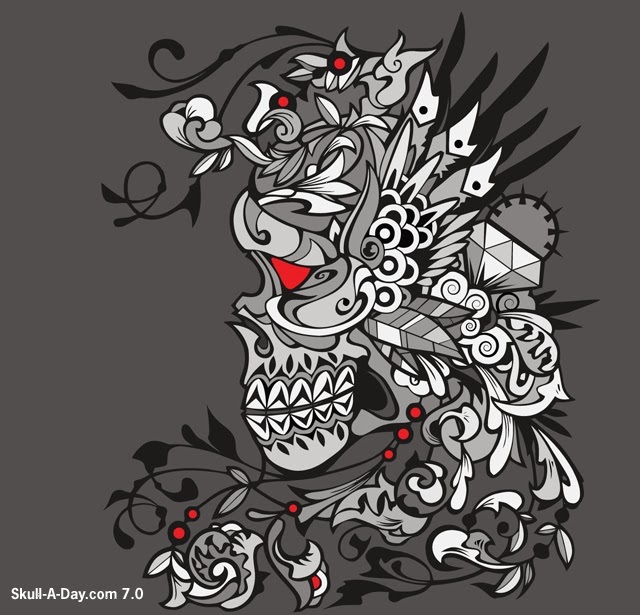 I like the blend of baroque and sugar skull elements. You can find more of her work on Facebook. 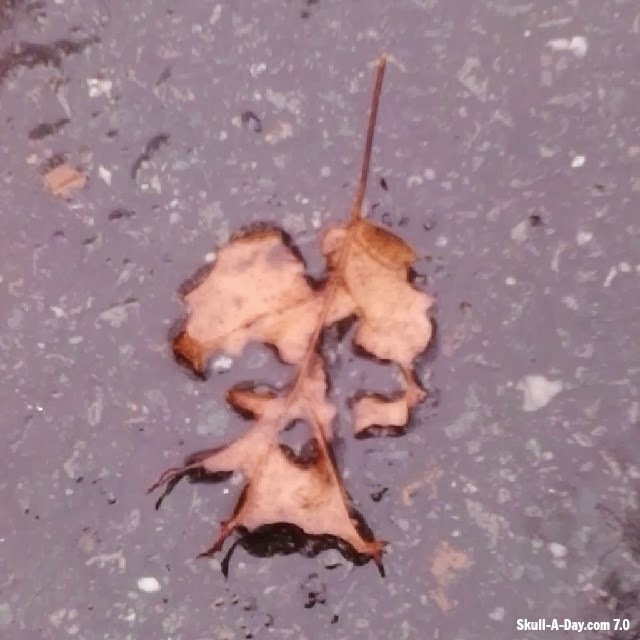 One day, on the way to my car, I was looking at the wet pavement, and spotted this skull shaped leaf. It was still there when I came home, so I picked it up and put it with my other skulls. 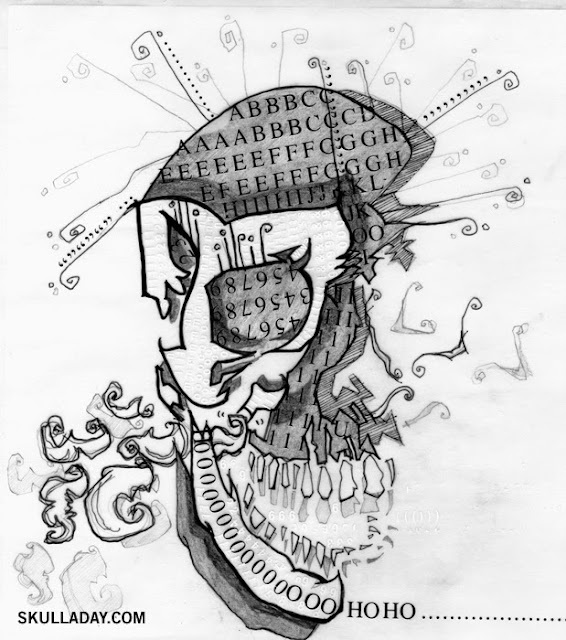 This big bold piece of skull work comes from Jared. He writes, "It's a huge piece.. 30"x 96" piece I did on commission". When it comes to tattoos and skulls I feel the same way, "Bigger is better". Thanks for sharing your wall of skulls with us, Jared! 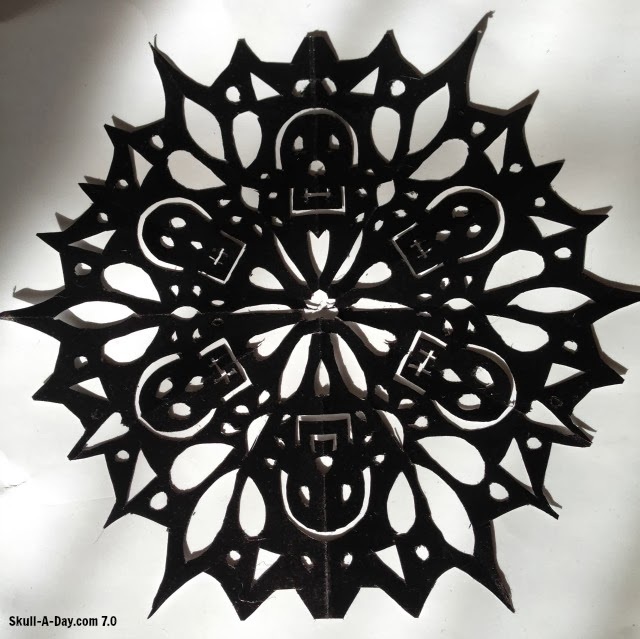 David Boone used my Skullflake Tutorial to create his own Skullflake. I love seeing the results of people tackling this intricate project. If you've made any skull artwork using one of my tutorials, or anything using our Free Stuff, please submit it to us! We'd love to share it! 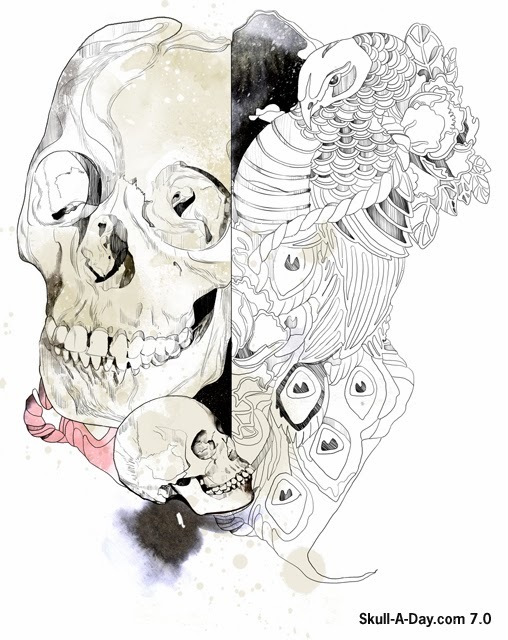 Local Richmond, VA artist, Bizhan Khodabandeh, created this dear skull image. 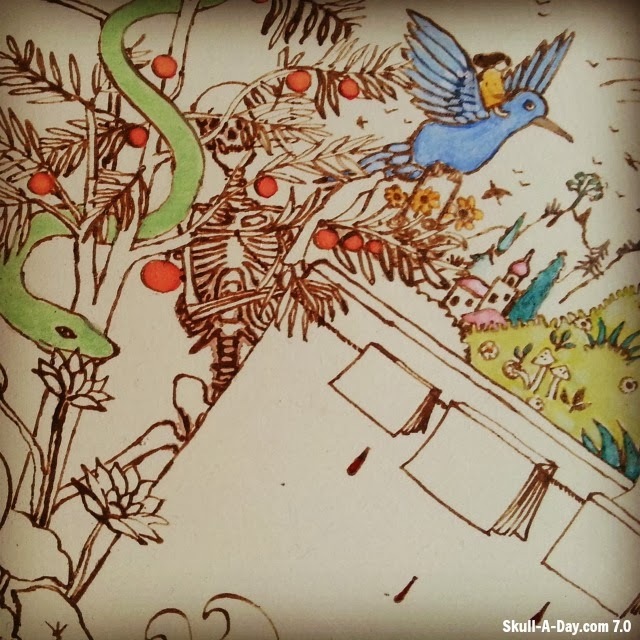 It is a pen and ink illustration that was digitally colored. 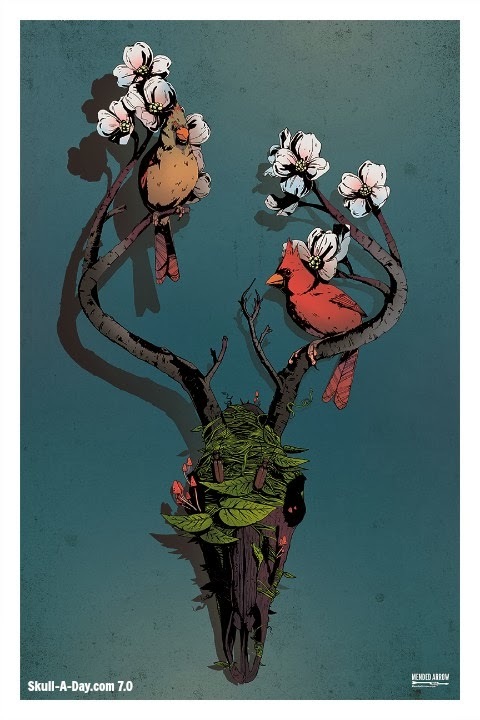 If you live in Virginia, you are probably familiar with the symbolism of the cardinals and dogwood. I love how these elements are incorporated into the deer skull, along with details commonly found on our forest floors. I love the seamless blend of life and death...the cycle of our world. Visit his website, Mended Arrow, to see more of and purchase Bizhan's artwork. Robert Tirado is a Venezuelan born illustrator and graphic artist currently based in Madrid, Spain. His style is characterized by mixing a wide variety of digital and manual techniques, mainly inspired by female beauty, fashion and photography, supported by the geometry, art, and music. His style is very expressive, bold yet soft. 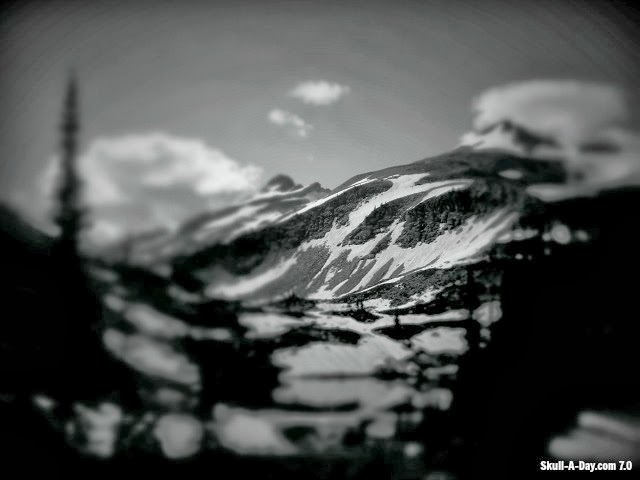 Thanks for sharing this with us, Robert! Generally our submitters contribute their own works of art, but in this situation a proud parent gets to display their offspring's talent. 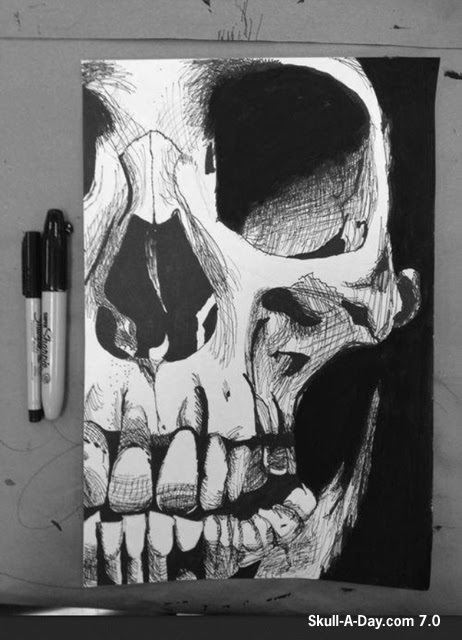 Today's skull is a beautiful drawing by Christopher Ryan. His Dad, Tony Ryan, is about as proud as any pop can be of his son. Christopher hopes to entertain the world with his art some day, and if he continues to create more work of this caliber then I'm sure Tony will be first in line at Christopher's first gallery show. 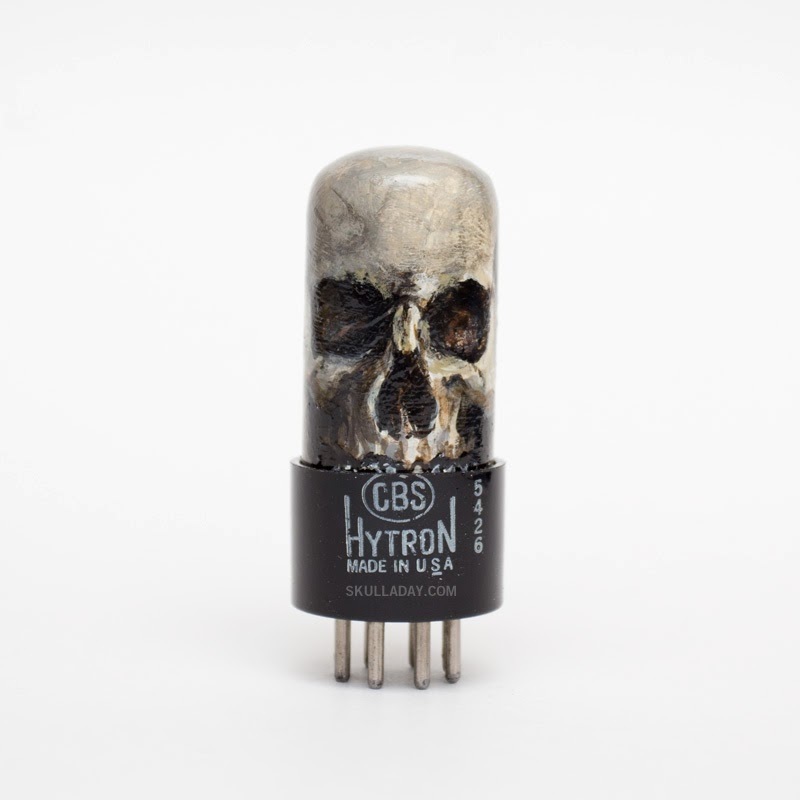 Thanks for sharing this super skull with us, Tony AND Christopher. Keep up the good work! 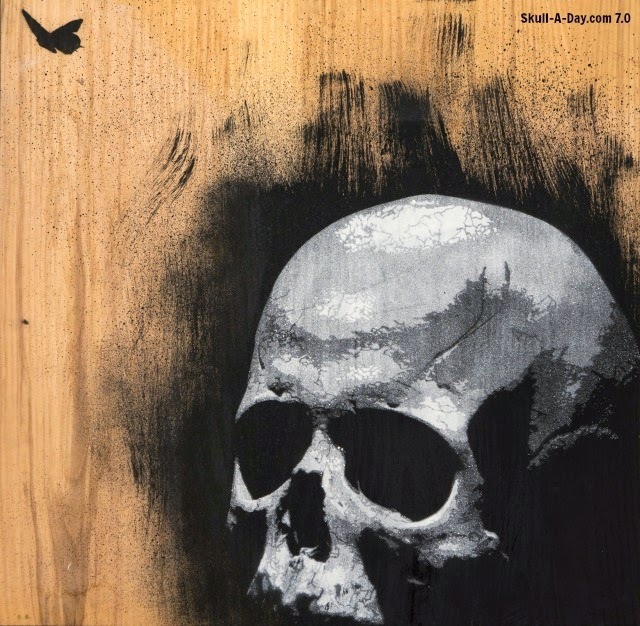 Nils Westergard created this skull using a stencil on wood. Nils is a street artist, who normally works in large scale. He creates stencils ahead of time, which he uses to mask areas while spraying around them. Want to try using a stencil yourself? Noah has 9. Stencil Skull, 232. Stylized Stencil Skull, 319. Two-Part Stencil Skull, and Laughing Skull available for your use. Don't forget to submit to us what you create using any of the Free Stuff, and we'll likely share it. You can find more of Nils' work on his Website, Flickr, and Facebook. Tim Andrew of The Rave 'N' Iron, "took this photo this summer while hiking with some friends at The Pinnacles in B.C., Canada." Having separation anxiety? These two wonderful works from Chad Turner in Brooklyn, NY may speak volumes to you. His paintings are all about bringing multiple visions into focus long enough to put them on canvas. The sometimes dark and twisted images in his portfolio are offset by some more elegant(and femininely eye pleasing) pieces that show how diverse his techniques can be. 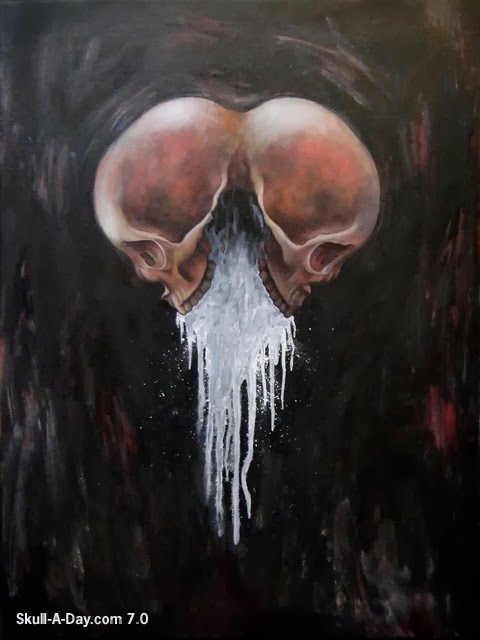 I'm just glad that he had some skulls to share with us so I could check out the rest of his talented work. Thanks, Chad! 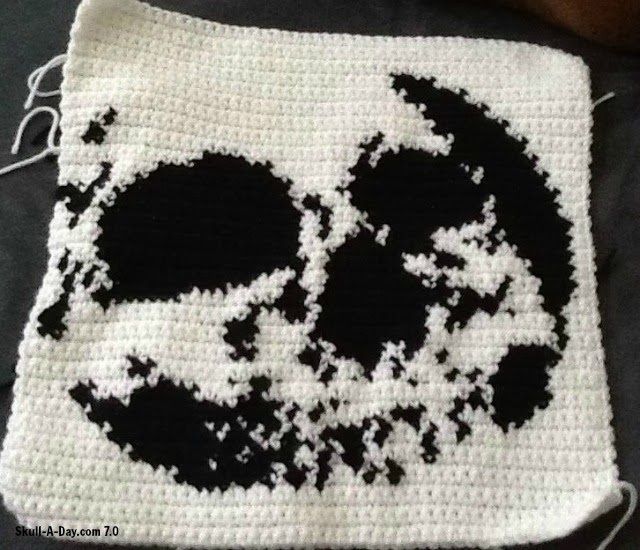 Denise Niemann from Katy TX used the Cross-Stitch Skull pattern to crochet this skull. I love seeing someone take a pattern for one type of fiber art for a different type of fiber art. Cross-stitch is done using a grid pattern. Some types of crochet and knit use the same type of grid, so those patterns can cross over, depending on how they are designed. Got to admit, I might try using filet crochet (my favorite) to make this image too. In case you are curious, Denise's piece looks like intarsia crochet, which is difficult and creates these impressive results. 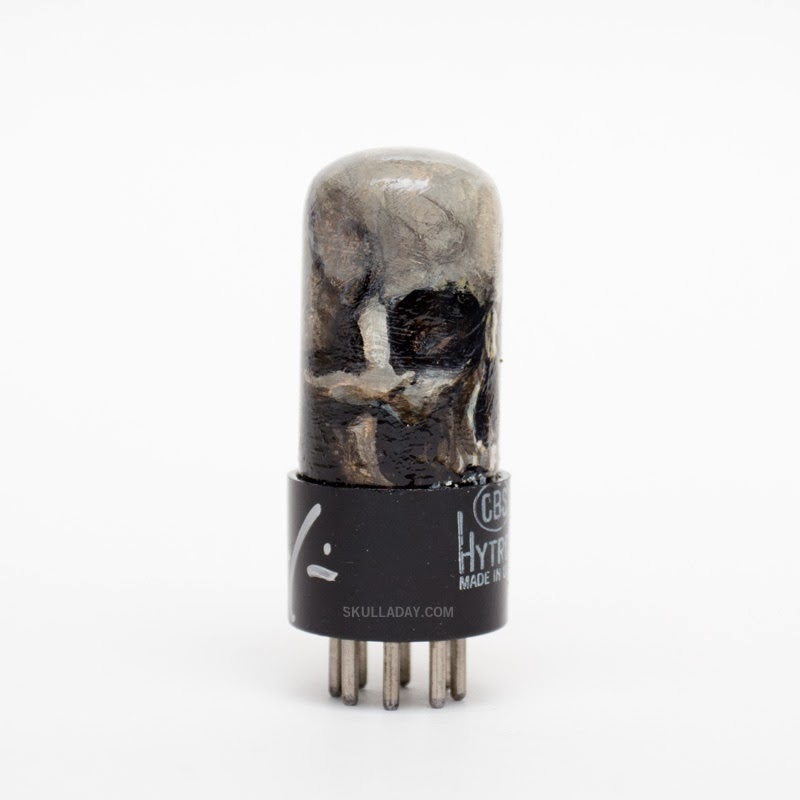 Another member of my Skeletube army of hand painted vintage vacuum tubes. This one was a commission for a good friend. 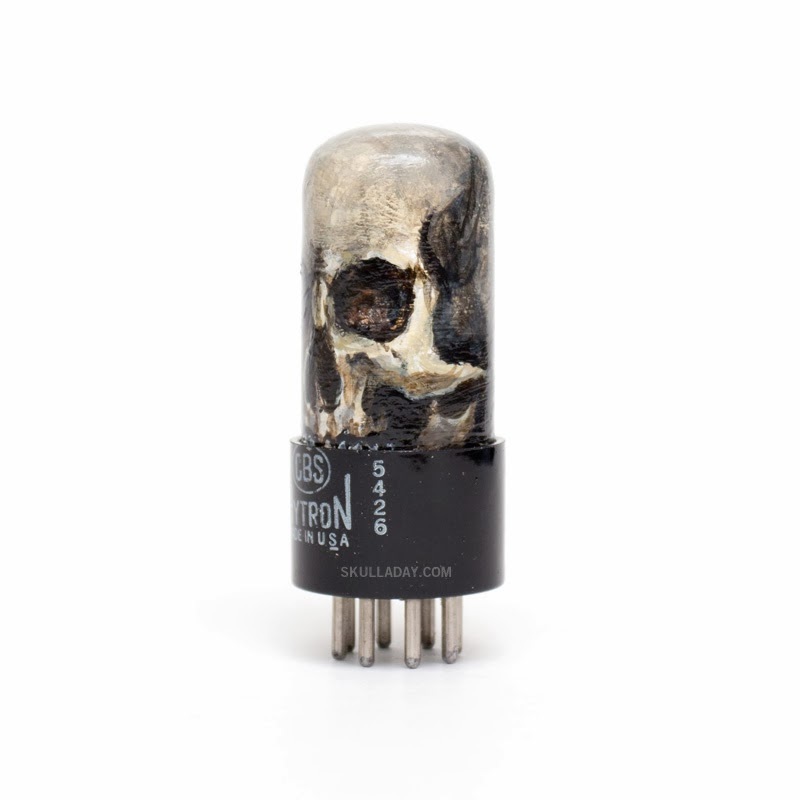 See my previous vacuum tube creations HERE. And hey, want one of your own? They're for sale HERE. 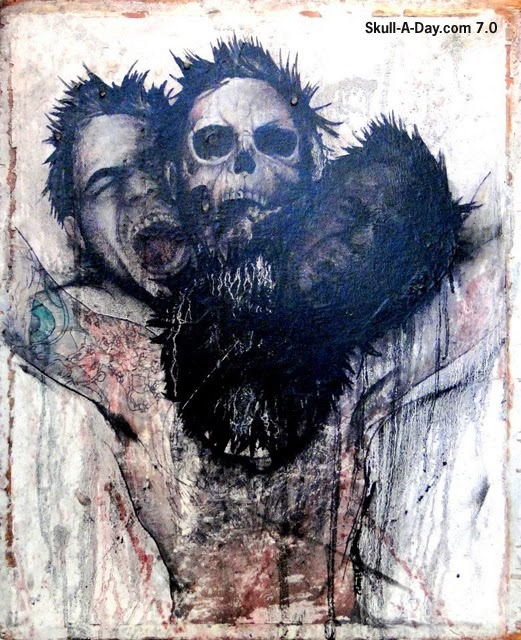 Nathan Callender of South Carolina is the man behind the skull in this beautiful work. It was done a few years ago by pen sketching and then scanning and converting to vector. An elegant picture of diversity while using just a few colors. Thanks for sharing it with us, Natahn! 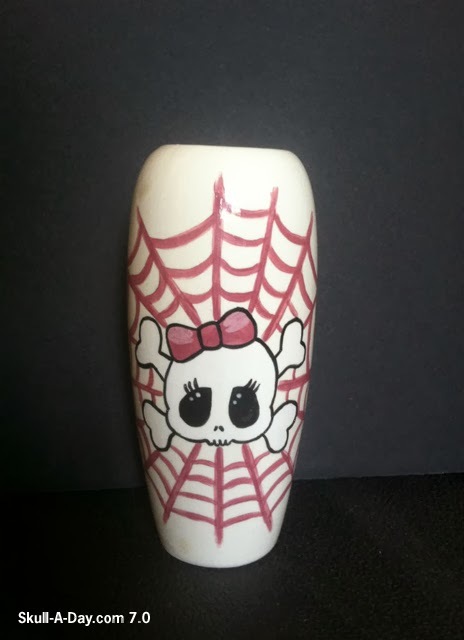 Kim DiLoreto from Medford Lakes, NJ is obviously a fan of skulls(and our site, thanks), BUUUT she also contributes to the Art-O-Mat world of vending machine dispensed art. 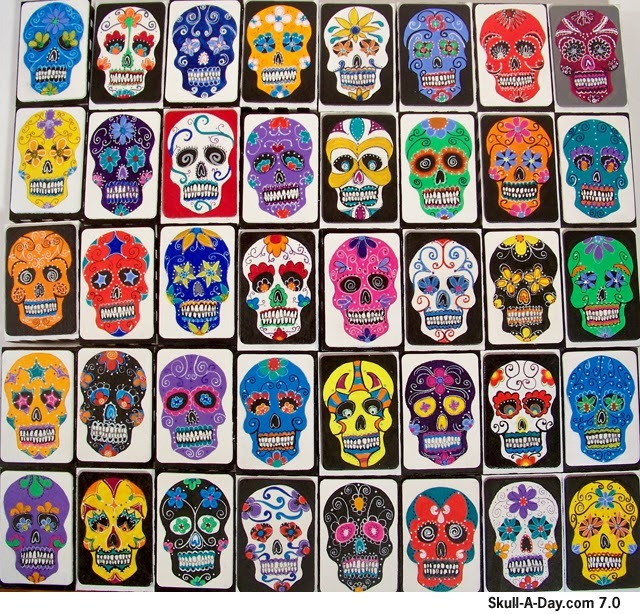 These Day of the Dead skull paintings are made for the machines, and whoever is lucky enough to enjoy them. She was nice enough to include an awesome pic featuring a multitude of these blockheads so that we could enjoy seeing all of them. 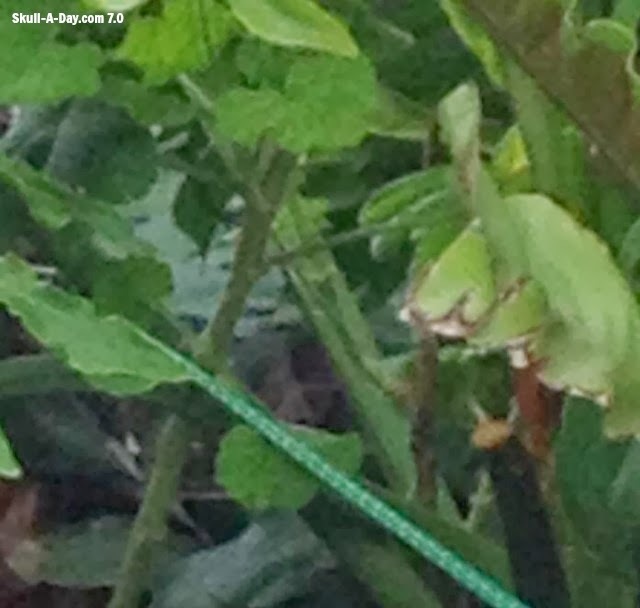 Thanks for sharing these with us, Kim! 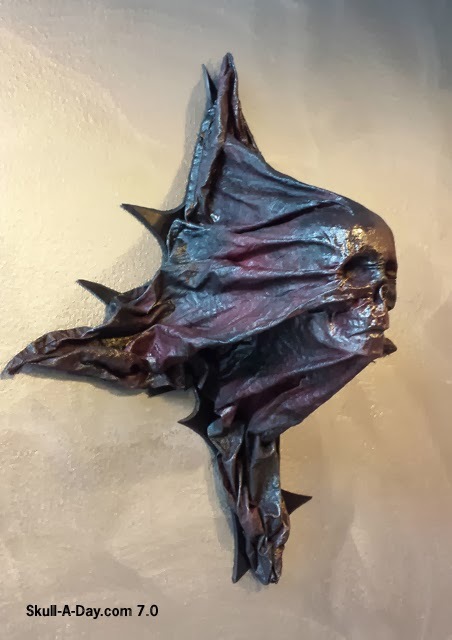 Zoe Brener made this skull with paper spirals. We've had a few quilled skulls on Skull-A-Day, but I've never seen on that uses spiraled paper on it's side. Quilling normally has coiled paper that is glued flat, so you can see the spirals. This stretches out those coils to create spiraled tubes. The curved patterns remind me of Noah's 246. Yarn Painting Skull. This is a great redesign of traditional quilling. Neil McIrvine of Melbourne, Australia found this skull in his garden. If you have trouble seeing the big one, look to the top left. I found a little one below it, towards the middle too. This bit of awesomeness is the handy work of Ed Harrington. I've seen other renditions of fictional characters in skeletal form, but Ed displays just how much of a true monster this character is. 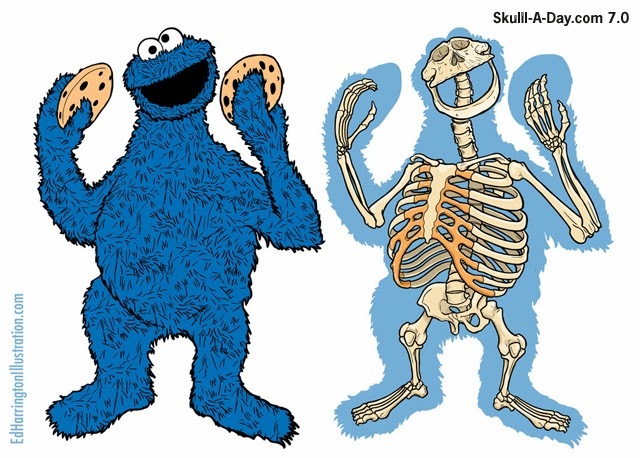 Especially with the toothless skull that seems like it would only be adaptable to gumming cookies into their original doughy state; not suitable for masticating any kind of food except for the cookie kind. Thanks for sharing this with us, Ed! 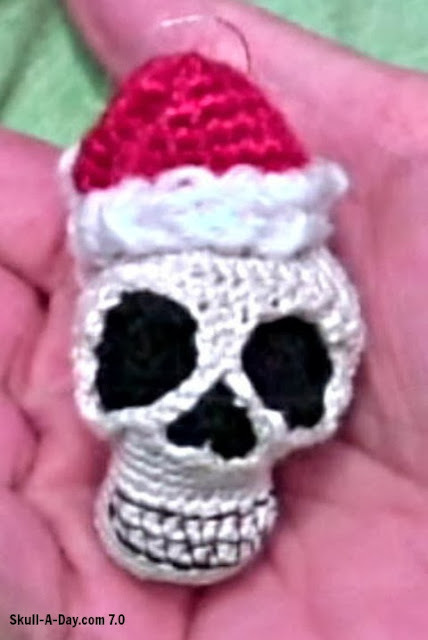 Kim Sofia of Sacramento, Ca, crocheted this Santa skull. She explained, "This is my new skull pattern, all my own. I gave him a Santa hat since it's that time of the year. but I've also made them with top hats, and no hats. 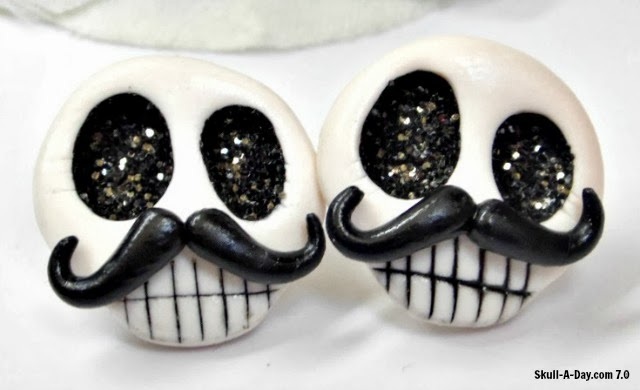 They were created just so I could decorate them as sugar skulls." I have a soft spot for crocheted skulls. I'm fond of 3D ones like Kim's, because sculptural crochet is the most challenging. A well done skull is a nice treat! Thanks for sharing this festive skull with us Kim! L.A.W. 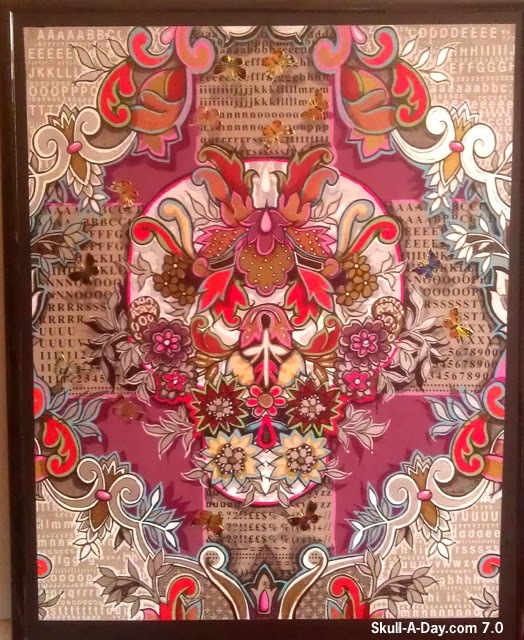 in Scotland created this fantastic mixed media piece using my free Laughing Skull Stencil! 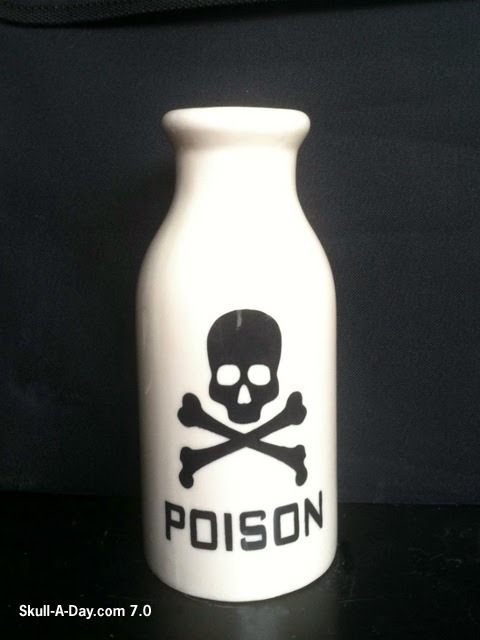 This year is off to a stellar start with a return from one of the most talented of skull carvers, Mark Noll. He's made generous contributions to our project before (here and here) and now he's back with his newest and extremely detailed "Mammoth Ivory" skull measuring in at 1 1/8"(2.8575 cm) tall. Mark included several positional photos and I couldn't help but upload them to gifmaker.me to create the animated gif to display all of it's beauty. Thanks for helping kick off 2014 in a great way, Mark! I hope we all have on hell of a skulltastic year!